With the exception of maybe the cowboy, is there any job more typically “American” than being a trucker? Now, it’s time to rethink that as the industry increasingly depends on drivers from many parts of the world. To see this shift up close, head 50 miles west of Los Angeles, just off Interstate 10, home to one of the busiest long-haul truck stops in the US. It's where tired drivers often park their 18-wheelers for the night and eat, shower and relax before hitting the road again. 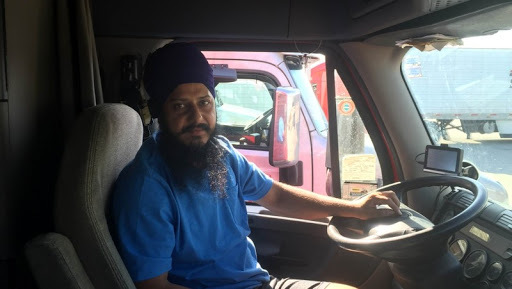 It's also where you'll see just how multinational the trucking industry is now because of drivers like Harsharan Singh, originally from Punjab, India. "I got my license back in 2009, when I came from India. Now, a lot of people from Romania, Yugoslavia, China, Japanese, Russians are coming into this business," says Singh, who hauls produce all across the Western US and Canada. Part of the reason behind the shift is that the trucking industry is facing a labor shortage of up to 48,000 drivers, according to the American Trucking Associations. That could balloon to more than 170,000 drivers in the next 10 years. "The trucking industry is searching for people," says Justin Lowery, who studies the role of immigrants in US trucking at George Mason University in Fairfax, Virginia. Lowery says there is an "aging out" of truck drivers and recent immigrants, willing to work long hours, are filling some of the gap. Nearly 30 percent of foreign-born drivers are now from Asia, the Middle East, the former Soviet republics and Europe. Most of the rest are from Latin America, according to the Census Bureau's 2012 American Community Survey. That survey also found that the proportion of immigrant drivers varies from state to state, with California at 46 percent, the highest concentration of foreign-born drivers, followed by New Jersey at 40 percent. "When I first got to this country, I never thought I would do this kind of a job. It was sort of a dream to do it," says Ukraine-born Steven Abramovich over an outdoor meal of cold cuts, hard-boiled eggs and some wine with fellow Ukrainian and Russian drivers in a corner of a vast truck stop in Ontario, California. Abramovich adds that a "trucker is a trucker" but feels foreign-born drivers, because of language and culture, create tighter communities than American drivers. "We are raised differently," he says. "I don't want to be disrespectful to the American community, but the Russian community, the Ukrainian community, the Turkish community, the Europeans : we are sitting together, we are having a nice meal." He looks at the vast truck stop, with more than 500 parking spots, most filled, and says, "There is no one sitting around gathered together just like us." But Ismael Abassov, who grew up in Russia and Turkey, is quick to add that when he started driving an 18-wheeler three years ago, American drivers always offered a helping hand when he needed it. "When I started, I didn't know this job, I had never done it, but I was asking and they helped me a lot." A lot of US-born truckers warn new drivers that the trucking life can be brutal. There are tight deadlines, often leading to substance abuse, and the long stretches away from home can be hard on marriages. Trucker Yancey Shipman has been at it for more than 30 years. "It is a way of life," he says. "It rules your being." But despite the hardships, for many new immigrant drivers, they'll take the trucking life - one route to the American dream.